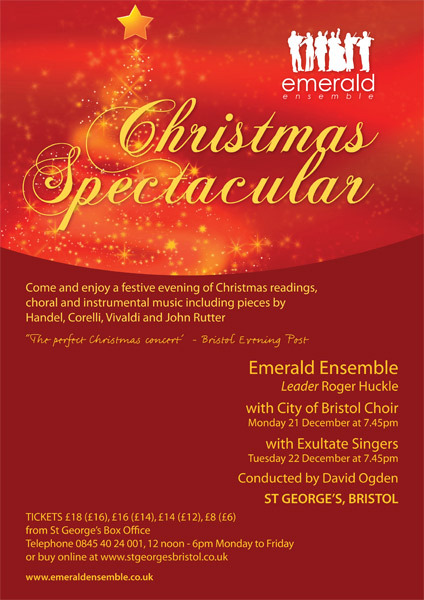 City of Bristol Choir teams up with Bristol’s professional orchestra the Emerald Ensemble for its annual Christmas Spectacular concert at St Georges, Bristol. Expect some popular orchestral classics along with well-known carols in sparkling orchestral arrangements. Programme to include works by Rutter, Vivaldi, Bach, Handel and Corelli as well as readings and audience carols. Last year’s concert was very popular so it’s advisable to book early. Tickets in Areas A and B are available by phone from the City of Bristol Choir ticket line. Credit card payments are accepted.